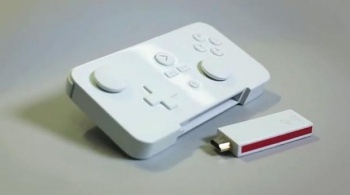 The GameStick is a tiny console that plugs directly into your HDTV. With a new console generation looming, people in the gaming industry are worried the whole honking hardware system is broken. It's expensive for developers to jump through the hoops Microsoft, Sony and Nintendo place before them to get their games playable on a big screen TV. The answer is to create a new ecosystem, and the Ouya attracted massive funding on Kickstarter with the premise of a $100 console with an open platform. But it looks like they weren't the only ones with this bright idea. A company called PlayJam is going even cheaper, with an $80 console and controller in one attractive package. In contrast to the Ouya's $950,000 asking price on Kickstarter, PlayJam is only looking for $100,000 to get the GameStick onto shelves by April 2013. The GameStick doesn't just want to be an open platform, Jasper Smith the CEO of GameJam wants it to be portable too. The 2" long GameStick doesn't look much bigger than a flash USB drive, and it fits directly inside the controller. "People are always on the go. Traditional consoles are big. We set out to create a big screen games console that was so small you could pop it in your pocket," the Kickstarter description reads. All you need to do is plug in the HDMI cord and you're good to play. A big worry about the Ouya is the gaming library is limited to only those titles on the Android platform, but GameStick says it has identified more than 200 games which will work really well on the big screen. "We are working with our network of over 250 developers including great studios such as Madfinger, Hutch, Disney and others to bring you the best line-up," goes the pitch. The Ouya has deals in place with Onlive and other game streaming services, but there's been nothing like that announced for the GameStick yet. Finally, I heard many rumblings from gaming insiders that the Ouya team couldn't deliver on its promise and were fuming that the Kickstarter earned more than $8 million on smoke and mirrors. Again, in contrast to the Ouya, the GameStick is almost complete and - if the funding is successful - could be delivered in less than 4 months. "We have been developing this project for a little over a year now. We have a working prototype of the GameStick as demonstrated below. It's not as pretty right now as it will be but it's ours and it's working. We're 90% of the way to getting the final pre-production sample in our hands," reads the Kickstarter page. I still don't know whether I want to play Android games on a TV, but I'm behind any attempt to change the paradigm of gaming production. If you are too, head to the GameStick Kickstarter campaign to check out their plan.